S. Azadi, M. Tafazzoli‐Shadpour, M. Soleimani, Majid E. Warkiani, “Modulating cancer cell mechanics and actin cytoskeleton structure by chemical and mechanical stimulations”, Journal of Biomedical Materials Research Part A, 2019. A. Kulasinghe, J. Kapeleris, C. Cooper, Majid E. Warkiani, K. O’Byrne, C. Punyadeera "Phenotypic Characterization of Circulating Lung Cancer Cells for Clinically Actionable Targets” Cancers, 2019. Z. Guo, C. Yang, M. Maritz, H. Wu, P. Wilson, Majid E. Warkiani, C. Chien, I. Kempson, A. Aref, B. Thierry, “Validation of a Vasculogenesis Microfluidic Model for Radiobiological Studies of the Human Microvasculature,” Advanced Materials Technologies, 2019. R. Moloudi, S. Oh, C. Yang, K. Teo, A. Lam, Majid E. Warkiani and M. Naing, “Scaled-up Inertial Microfluidics: Retention System for Microcarrier-based Suspension Cultures,” Biotechnology Journal, 2019. S. Biglari, Thi Y. L. Le, R. Tan, S. Wise, A. Zambon, G. Codolo, M. De Bernard, Majid E. Warkiani, S. Naficy, P. Valtchev, A. Khademhosseini and F. Dehghani, “Simulating Inflammation in a Wound Microenvironment using a Dermal Wound-on-Chip Model”, Advanced Healthcare Materials, 2019. M. Rezaei, M. Winter, D. Zander-Fox, C. Whitehead, Majid E. Warkiani, T. Hardy, and B. Thierry "A Reappraisal of Circulating Fetal Cell Non-Invasive Prenatal Testing", Trends in Biotechnology, 2018. A. Gerami, Y. Alzahid, P. Mostaghimi, N. Kashaninejad, F. Kazemifar, T. Amirianshoja, N. Mosavat, Majid E. Warkiani, and R.T. Armstrong “Microfluidics for Porous Systems: Fabrication, Microscopy and Applications", Transport in Porous Media, 2018. S. Razavi, S. ghorbani, S. Vasilescu, M. Asadnia, A. Abouei, and Majid E. Warkiani "A Hybrid Micromixer with Planar Mixing Units", RSC Advances, 2018. H Stefen, A. Hassanzadeh, S. Fok, N. Tedla, T. Barber, Majid E. Warkiani, T. Fath "A novel microfluidic device-based neurite outgrowth inhibition assay reveals the neurite outgrowth-promoting activity of tropomyosin Tpm3.1 in hippocampal neurons", Cellular and Molecular Neurobiology, 2018. R. Moloudi, S. Oh, C. Yang, K. Teo, A. Lam, Majid E. Warkiani and M. Naing, “Inertial-Based Filtration Method for Removal of Microcarriers from Mesenchymal Stem Cell Suspensions” Scientific Reports, 2018. A. Kulasinghe, H. Wu, C. Punyadeera and Majid E. Warkiani, “The Use of Microfluidic Technology for Cancer Applications and Liquid Biopsy,” Micromachines, 2018. J. Kapeleris, A. Kulasinghe, Majid E Warkiani, I. Vela, L. Kenny, K. O'Byrne, and C. Punyadeera “The prognostic role of Circulating Tumour Cells (CTCs) in Lung Cancer”, Frontiers in Oncology, 2018. H. Tavassoli, S. Naghavi Alhosseini, A. Tay, P. Chan, S. Kah Weng Oh, and Majid E. Warkiani “Large-scale Production of Stem Cells Utilizing Microcarriers: A Biomaterials Engineering Perspective from Academic Research to Commercialized Products, Biomaterials, 2018. A. Hassanzadeh, A. M. K. Law, A. Hejri, M. Asadnia, C. J. Ormandy, D. Gallego-Ortega and Majid E. Warkiani, “Static droplet array for culturing single live adherent cells in an isolated chemical microenvironment”, Lab on a chip, 2018. B. Abbsanejad, W. Thorby, A. Razmjou, D. Jin, M. Asadnia, Majid E. Warkiani, “MEMS piezoresistive flow sensors for sleep apnea therapy” Sensors & Actuators A, 2018. M. Winter, T. Hardy, M. Rezaei, V. Nguyen, D. Zander-Fox, Majid E. Warkiani, and B. Thierry " Isolation of Circulating Fetal Trophoblasts using Inertial Microfluidics for Non-Invasive Prenatal Testing" Advanced Materials Technologies, 2018. M. Motamedi, Majid E. Warkiani, R. Taylor "Transparent Surfaces Inspired by Nature," Advanced Optical Materials, 2018. G. Marsavela, C. Aya-Bonilla, Majid E. Warkiani, E. Gray and Mel Ziman "Melanoma Circulating Tumor Cells: Benefits and Challenges Required for Clinical Application", Cancer Letters, 2018. H. Tavassoli, J. Javadpour, M. Taheri, M. Mehrjou, N. Koushki, F. Arianpour, M. Majidi, J. Izadi-Mobarakeh, B. Negahdari, P. Chan, M.E. Warkiani, and S. Bonakdar, “Incorporation of Nano-Alumina Improves Mechanical Properties and Osteogenesis of Hydroxyapatite Bioceramics”, ACS Biomaterials Science & Engineering, 2018. R. Moloudi , C. Yang , S. Oh, M.E. Warkiani and M. Lim, “Investigation of inertial particle focusing dynamics in a trapezoidal straight microchannel: Application to particle filtration ”, Microfluidics and Nanofluidics, 2018. K. Moshksayan, N. Kashaninejad, M.E. Warkiani, J.G. Lock, H. Moghadas, M.S. Saidi, and N.T. Nguyen, “Spheroids-on-a-chip: Recent advances and design considerations in microfluidic platforms for spheroid formation and culture”, Sensors and Actuators B, 2018. H. Khan , A. Razmjou , M.E.Warkiani , A. Kottapalli and M. Asadnia, “Sensitive and Flexible Polymeric Strain Sensor for Accurate Human Motion Monitoring”, Sensors, 2018. S. Sofela, S. Sahloul, M. Rafeie, T.Kwon, J. Han, M.E. Warkiani, Yong-Ak Song, "High-throug.hput sorting of eggs for synchronization of C. elegans in a microfluidic spiral chip" Lab on a chip, 2018. A. Kulasinghe, H. Schmit, C. perry, B. Whitfieled, L. Kenny, C. Nelson Majid E. Warkiani, C. Punyadeera "A collective route to head and neck metastasis” Scientific Reports (Nature Publishing Group), 2018. P. Moazzam, H. Tavassoli, A. Razmjo, M.E. Warkiani and M. Asadnia, “ Bio-inspired surface modification of porous membranes for fog harvesting applications using microfabrication ” Desalination, 2018. S. Ghorbani, H. Eyni, T. Tiraihi, L. Salari Asl, M. Soleimani, A. Atashi, S. Pour Beiranvand, Majid E. Warkiani, “ Combined effects of 3D bone marrow stem cell-seeded wet-electrospun poly lactic acid scaffolds on full-thickness skin wound healing” International Journal of Polymeric Materials and Polymeric Biomaterials, 2018. Maira Shakeel Syed, Mehdi Rafeie, Rita Henderson, Dries Vandamme, Rob Taylor, Mohsen Asadnia, and Majid E. Warkiani, “Selective Separation of microalge cells using inertial microfluidics”, Bioresource Technology, 2017. A. Razmjou, M. Asadnia, O. Ghaebi, H. Yang, Majid E. Warkiani, J. Hou, V. Chen, “ Preparation of Iridescent 2D Photonic Crystals by using a Mussel-Inspired Spatial Patterning of ZIF-8 with potential applications in optical switch and chemical sensor” ACS Applied Materials & Interfaces, 2017. D Sengupta, AGP Kottapalli, SH Chen, JM Miao, CY Kwok, MS Triantafyllou, Majid E. Warkiani, M Asadnia, “Characterization of single polyvinylidene fluoride (PVDF) nanofiber for flow sensing applications” AIP Advances, 2017. A. Gerami, R.T. Armstrong, B. Johnston, Majid E. Warkiani, N. Mosavat, P. Mostaghimi, “Coal-On-a-Chip: visualizing flow in coal fractures,” Energy and Fuel, 2017. M. Asadnia, A. P. Kottapalli, Majid E. Warkiani, “An Accurate PSO-GA Based Neural Network to model Growth of Carbon Nanotubes,” Journal of Nanotechnology, 2017. M. Asadnia, M. Mousavi, S.H. Chan, Majid E. Warkiani, “Development of a fiber-based membraneless hydrogen peroxide fuel cell,” RSC Advances, 2017. C. Aya-Bon illa, G. M arsavela, J. Freeman, C. Lomma, M. Frank, M. Khattak, T. Meniawy, M. Millward. Majid E. Warkiani, E. Gray and Mel Ziman "Isolation and detection of circulating tumour cells from metastatic melanoma patients using a slanted spiral microfluidic device", Oncotarget, 2017. Taehong Kwon, Holly Prentice, Jonas De Oliveira, Nyasha Madziva, Majid E. Warkiani, Jean Hamel, and Jongyoon Han “Microfluidic cell retention device for perfusion of mammalian suspension culture”, Scientific Reports (Nature Publishing Group), 2017. Maira Shakeel Syed, Mehdi Rafeie, Rita Henderson, Dries Vandamme, Mohsen Asadnia, and Majid E. Warkiani, “A 3D-printed mini-hydrocyclone for high throughput particle separation: Application to primary harvesting of microalgae”, Lab on a chip, 2017. A. Kulasinghe, C. Perry, Majid E. Warkiani, T. Blick, A. M. Davies, K. O’Byrne, E. W. Thompson, C. Nelson, I. Vela, C. Punyadeera "PDL-1 expressing circulating tumor cells in head and neck cancers” BMC Cancer, 2017. Naveen Ramalingam, Majid E. Warkiani, and Thomas Gong Hai-Qing “Acetylated bovine serum albumin differentially inhibits polymerase chain reaction in microdevices”, Biomicrofluidics, 2017. E. Shirani, A. Razmjou, H.Tavassoli, A. Landarani-Isfahani, S. Rezaei, A. bolghasem Abbasi Kajani, M. Asadnia, Jingwei Hou, Majid E. Warkiani, "Strategically designing a pumpless microfluidic device on an “inert” polypropylene substrate with potential application in biosensing and diagnostics", Langmuir, 2017. Amer Alizadeh, Majid E. Warkiani, Moran Wang, “Manipulating electrokinetic conductance of nanofluidic channel by varying inlet pH of solution” Microfluidics and Nanofluidics, 2017. Mehdi Rafeie, Marcel Welleweerd, Amin Hassanzadeh-Barforoushi, Mohsen Asadnia, Wouter Olthuis, Majid E. Warkiani “An easily fabricated three-dimensional threaded lemniscate-shaped micromixer for a wide range of flow rates”, accepted, Biomicrofluidics, 2017. Arutha Kulasinghe, Thao Tran, Tony Blick, Ken O’Byrne, Erik Thompson, Majid E. Warkiani, Colleen Nelson, Liz Kenny, Chamindie Punyadeera “Enrichment of circulating head and neck tumour cells using spiral microfluidic technology”, accepted, Scientific Reports (Nature Publishing Group), 2017. Amin Hassanzadeh, J. Shemesh, Nona Farbehi, Mohsen Asadnia, Guan Heng Yeoh, Richard Harvey, Robert Nordon, and Majid E. Warkiani “A rapid co-culture stamping device for studying intercellular communication” Scientific Reports (Nature Publishing Group), 2016. E. Zarepour, M. Hassan, C.T. Chou, Majid E. Warkiani “Characterizing Terahertz Channels for Monitoring Human Lungs with Wireless Nanosensor Networks​” Nano Communication Networks, 2016. M. Asadnia, A.P. Kottapalli, K. D. Karavitaki, Majid E. Warkiani, J. Miao, D.P. Corey, M. Triantafyllou, “From Biological Cilia to Artificial Flow Sensors: Biomimetic Soft Polymer Nanosensors with High Sensing Performance” Scientific Reports (Nature Publishing Group), 2016. A. Kulasinghe, C. Perry, Majid E. Warkiani, T. Blick, A. M. Davies, K. O’Byrne, E. W. Thompson, C. Nelson, I. Vela, C. Punyadeera “Short term ex-vivo expansion of circulating head and neck tumour cells” Oncotarget, 2016. Naveen Ramalingam, Majid E. Warkiani, Neevan Ramalingam, Gholamreza Keshavarzi, Liu Hao-Bing, and Thomas Gong Hai-Qing “Numerical and experimental study of capillary-driven flow of PCR solution in hybrid hydrophobic microfluidic networks”, Biomedical Microdevices, 2016. Mehdi Rafeie, Jun Zhang, Mohsen Asadnia, Weihua Li and Majid E. Warkiani “Multiplexing slanted spiral microchannels for ultra-fast blood plasma separation”, Lab on a chip, 2016. Andrea Pavesi, Giulia Adriani, Andy Tay, Majid E. Warkiani, Yeap Wei Hseun, Siew Cheng Wong and Roger D. Kamm "Engineering a 3D microfluidic culture platform for tumor-treating field application", Scientific Reports (Nature Publishing Group), 6, 26584, 2016. Alireza Gerami, Peyman Mostaghimi, Ryan T. Armstrong, Ali Zamani, Majid Ebrahimi Warkiani “A microfluidic framework for prediction of relative permeability in coal” International Journal of Coal Geology, 159,183–193, 2016. Zahra Hesari, Massoud Soleimani, Fatemeh Atyabi, Meysam Sharifdini, Samad Nadri, Majid E. Warkiani, Rassoul Dinarvand, "A hybrid microfluidic system for regulation of neural differentiation in induced pluripotent stem cells", Biomedical Materials Research: Part A, 104(6), 1534-43, 2016. Andy Tay, Saeed Rismani Yazdi, Andrea Pavesi, Chwee Teck Lim and Majid E. Warkiani “Advances in microfluidics in combating infectious diseases”, Biotechnology Advances, 2016. Bee Luan Khoo, Parthiv Chaudhuri, Naveen Ramalingam, Daniel Tan, Chwee Teck Lim and Majid E. Warkiani, “Single‐cell profiling approaches to probing tumor heterogeneity”, International Journal of Cancer​, accepted, 2016. Jun Zhang, Sheng Yan, Dan Yuan, Gursel Alici, Nam-Trung Nguyen, Majid E. Warkiani, and Weihua Li “Fundamentals and Applications of Inertial Microfluidics: A Review”, Lab on a chip, 16, 10-34, 2016. Majid E. Warkiani, Bee L. Khoo, Lidan Wu, Andy Tay, Ali Asgar S. Bhagat, Jongyoon Han and Chwee Teck Lim “Ultra-fast, label-free isolation of circulating tumor cells from blood using spiral microfluidics”, Nature Protocols, 11,134-148, 2016. J. Shemesh, I. Jalilian, A. She, G. Yeo, M. Knothe and Majid E. Warkiani “Flow induced stress on adherent cells in microfluidic devices”, Lab on a chip, 15, 4114-4127, 2015. M. Asadnia, A.G.P Kottapalli, Majid E. Warkiani, J. M Miao, M Triantafyllou. Lateral-Line Inspired MEMS Piezoelectric Haircell Arrays for Fish-Like Sensing. Royal Society Interface, 12, 2050322, 2015. Majid E. Warkiani, Andy Tay, Guofeng Guan and Jongyoon Han “Membrane-less microfiltration Using Inertial Microfluidics”, Scientific Reports (Nature Publishing Group), 2015. Bee L. Khoo, Soo C. Lee, Prashant Kumar, Tuan Z. Tan, Majid E. Warkiani, Samuel GW Ow, Sayantani Nandi, Chwee Teck Lim and Jean Paul Thiery, “Expansion of breast circulating cancer cells predicts response to anti-cancer therapy”, Oncotarget, 2015. Parthiv K. Chaudhuri, Majid E. Warkiani, Tengyang Jing, Kenry, and Chwee Teck Lim “Microfluidics for Research and Applications in Oncology”, Analyst, 2015. Majid E. Warkiani, Lidan Wu, Andy Tay, and Jongyoon Han “Large-volume microfluidics cell sorting for biomedical applications”, Annual Review of Biomedical Engineering, 2015. 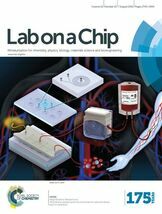 Majid E. Warkiani, Andy Tay, Khoo Bee Luan, Xu Xiaofeng, Jongyoon Han and Chwee Teck Lim “Malaria detection using inertial microfluidics”, Lab on a chip, 15, 1101-1109, 2015. Majid E. Warkiani, Filicia Wicaksana, Anthony Fane, and Thomas Gong “Investigation of membrane fouling at the micro-scale using isopore filters”, Microfluidics and Nanofluidics, 1-9, 2014. Tengyang Jing, Ramesh Ramji, Majid E. Warkiani, Jongyoon Han, Chwee Teck Lim, Chia-Hung Chen “Jetting microfluidics with size-sorting capability for single-cell protease detection”, Biosensor and Bioelectronics, 66, 19-23, 2014. Bee Luan Khoo, Majid E. Warkiani, Daniel Shao-Weng Tan, Ali Asgar S. Bhagat, Darryl Irwin, Alvin S.T. Lim, Kiat Hon Lim, Wan-Teck Lim, Yoon Sim Yap, Soo Chin Lee, Ross A. Soo, Priscilla Hunt, Jongyoon Han, Chwee Teck Lim “Clinical validation of an ultra-high throughput microfluidic device for detection and enrichment of viable rare circulating tumor cells in blood”, PlosOne, 9 (7), e99409, 2014. Majid E. Warkiani, Bee Luan Khoo, Daniel Shao-Weng Tan, Ali Asgar S Bhagat, Wan-Teck Lim, Yoon Sim Yap, Soo Chin Lee, Ross A Soo, Jongyoon Han, Chwee Teck Lim “An ultra-high-throughput spiral microfluidic biochip for the enrichment of circulating tumor cells”, Analyst, 139 (13), 3245-3255, 2014. Majid E. Warkiani, Guofeng Guan, Khoo Bee Luan, Wong Cheng Lee, Ali Asgar S. Bhagat, Daniel Shao-Weng Tan, Soo Chin Lee, Wan Teck Lim, Peter C Y Chen, Chwee Teck Lim, Jongyoon Han “Slanted spiral microfluidics for ultra-fast, label-free circulating tumor cells isolation”, Lab on a chip, 2014. 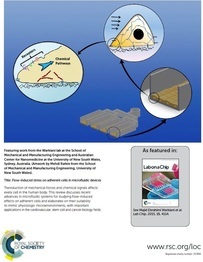 Majid E. Warkiani, Ali Agar S. Bhagat, Khoo Bee Luan, Jongyoon Han, Chwee Teck Lim, Tony Fane, Thomas Gong “Isoporous micro/nanoengineered membranes”, ACS Nano, 7 (3), pp 1882–1904, 2013. 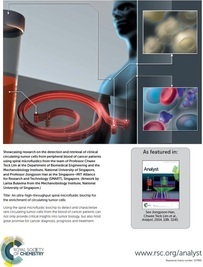 Hanwei Hou, Majid E. Warkiani, Khoo Bee Luan, Zi Rui Li, Daniel Shao-Weng Tan, Wan-Teck Lim, Jongyoon Han, Ali Agar S. Bhagat and Chwee Teck Lim “isolation and retrieval of circulating tumor cells using centrifugal forces”, Scientific Reports (Nature Publishing Group) 3,1259, 2013. Majid E. Warkiani, Liu-Hoabing, Chao-Ping Lou, and Hai-Qing Gong “A high-flux isopore micro-fabricated membrane with integrated back-support for isolation of waterborne pathogens”, Biomedical Microdevices, pp.1-9, 2012. Majid E. Warkiani, Longqing Chen, Hao-Bing Liu, Chao-Ping Lou, Zhang Rui, and Hai-Qing Gong, “Capturing and recovery of Cryptosporidium oocysts with polymeric micro-fabricated filter”, Membrane Science 369, pp.560-568, 2011. Majid E. Warkiani, Chao-Ping Lou, and Hai-Qing Gong, “Fabrication and characterization of microporous polymeric micro-filter for isolation of Cryptosporidium parvum oocysts”, Micromechanics and Microengineering, 21(3), art. no. 035002, 2011. M. Olfatnia, Z. Shen, J.M. Miao, L.S. Ong, T. Xu and Majid E. Warkiani, “Medium damping influences on resonant frequency and quality factor of piezoelectric circular microdiaphragm sensors”, Micromechanics and Microengineering, 21, 2011. Majid E. Warkiani, Hai-Qing Gong, and A.G. Fane, "Surface modification of micro/nano-fabricated filters", Key Engineering Materials 508, pp.87-98, 2011. Majid E. Warkiani, Chao-Ping Lou, and Hai-Qing Gong “Fabrication of multi-layer polymeric micro-sieve having narrow slot pores with conventional ultraviolet-lithography and micro-fabrication techniques”, Biomicrofluidics 5 (3), art. no. 036504, 2011. Longqing Chen, Majid E. Warkiani, Hao-Bing Liu, Chao-Ping Lou, and Hai-Qing Gong, "Polymeric micro-filter manufactured by dissolving mold technique", Micromechanics and Microengineering. 20 (7), art. no. 075005, 2010. Majid E. Warkiani, and Chwee T. Lim. Materiomics: Multiscale Mechanics of Biological Materials and Structures, M J Buehler, R Ballarini (eds. ), Springer, Vienna, Austria, pp. 107-119, 2013. Andy Tay, Bee Luan Khoo and Majid E. Warkiani, Frugal Innovation in Bioengineering for the Detection of Infectious Diseases, R Ramji, A Chavali, in press, Springer International Publishing AG, Gham, 2016. Bee L. Khoo, Parthiv C. Chaudhuri and Majid E. Warkiani, Ex-vivo Engineering of Tumour Environment, in press, A Aref, D Barbie, Springer International Publishing AG, Gham, 2017. Hardik Pandya, Mohamad Draz, Majid E. Warkiani and Hadi Shafiee, Rapid Diagnose of Infectious Diseases Using Microfluidics, in press, Francesco, Springer International Publishing, 2017. Majid E. Warkiani and Hai-Qing Gong "A multi-layer polymeric micro-filter with slotted pores" US Patent (2011), Application no: 201106927-5. Majid E. Warkiani and Hai-Qing Gong "Fabrication of Isopore metallic micro/nano filter with conventional lithography and MEMS techniques" US Patent (2011), Application no: 201106802-0. Majid E. Warkiani et al. “System and method for inertial focusing microfiltration for intra-operative blood salvage autotransfusion” US Patent (2014), Docket No. 4471.1024-000.